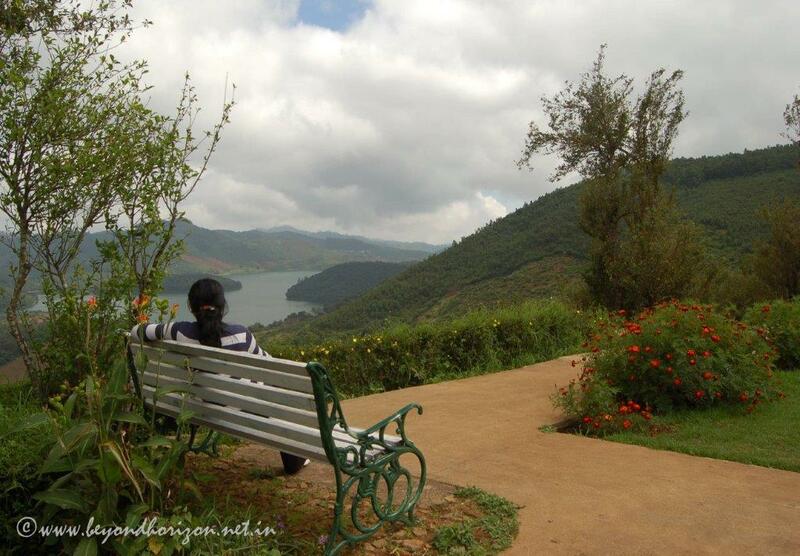 I learnt about Avalanchi and Red Hills Eco Resort while chatting up with a friend about our holiday plan to Ooty. And thank God, I did that! A look at couple of photographs and I knew this was a place I must visit. I made the bookings soon after. 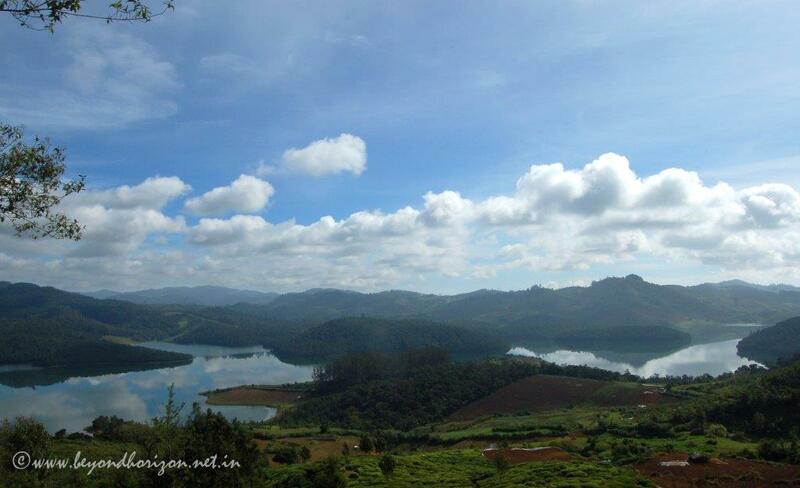 I arrived in Ooty in December with my family. It was bright and cold, with minimum temperature hovering around 5°C. 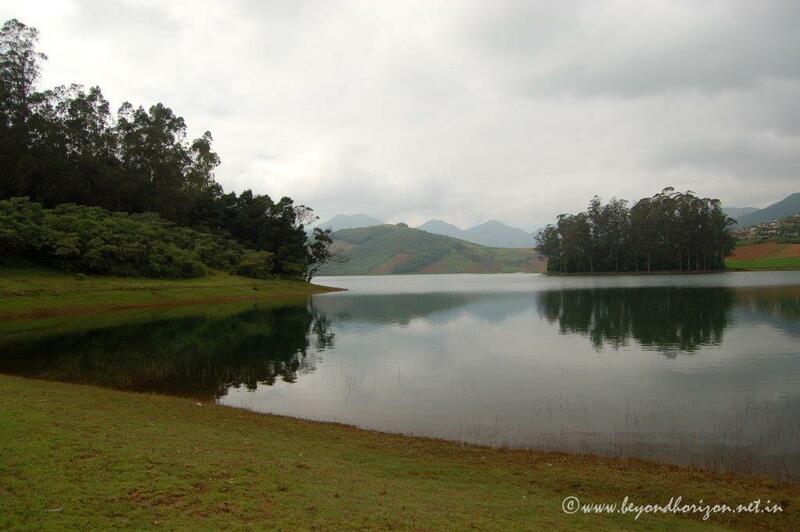 Avalanchi is about 25 km from Ooty and at a higher elevation. As we left the town, driving up the mountains through winding roads surrounded by tea bushes, the vista opens up. Orderly, well maintained tea plantations sloping down the hillside, with rows of shade trees standing tall sporadically, present a pretty picture. As we climbed a little higher, I started feeling the chill in the air, in spite of the late morning sun. Few turns and a little distance away a large lake comes in to view. The reflection of the blue sky on the quiet water, surrounded by green hills, was so refreshing. Before long, our car pulled up to a green patch of grass by the side of the road and we were at the bank of Emerald lake. We got down to explore the place. Here the water of two lakes, Emerald and Avalanchi, has merged under a small bridge that connects two hills. All we could hear was the rhythmic sound of small waves breaking on the lake shore, some occasional bird calls and the tinkle of the bell on a lone cow grazing nearby. Sitting by the water, watching the reflection of the mountains quivering on the water, as a strong wind blows and the clouds drift away, brings a feeling that time has stopped. It was time to start again. It took us another 30 minutes driving through winding roads to reach Red Hills in Avalanchi town. Getting down from the car, I encountered this stunning landscape, far beyond my expectation. The Resort is perched on the side of a mountain at 7200 feet, with an almost 180° view of the surrounding hills and Avalanchi and Emerald lakes below. The immediate surroundings are covered by tea bushes, sloping away towards the water below, like a giant green carpet. 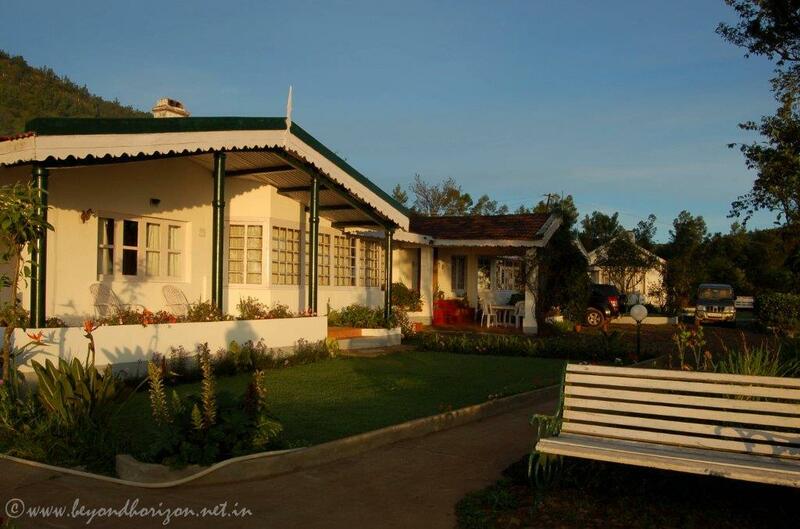 Red Hills is not a usual resort, rather a luxurious homestay – a majestic 125 years old Planter’s Bungalow, in the middle of a 300 acre tea estate. The owner Mr Vijay Kumar and his wife live in a part of the bungalow and use the remaining few rooms to run an eco-tourism facility. The place is friendly and makes you feel at home instantly. You have many options for outdoor activities here, but with such an awesome view in front of you, it is absolutely okay just to sit back, relax and do nothing. Just enjoy the solitude amidst the vast expanse of waters reflecting the blue sky. Very soon you will forget the city life that you left behind and be one with nature. As we were sitting down with a cup of tea in the lawn, Moby, the big German Shepherd, came running to us, energetically wagging his tail. After a round of heavy petting, he sat down on the grass nearby. Some more interactions and we became friends. He won’t let you stay idle when he is around. You have to play with him with all attention. Moby is so adorable that it is difficult not to fall in love with him. In the evening, it started getting cold and it was time to gather in the living room and catch up with other guests. There was a library and few indoor games to keep us busy. But, we preferred to sit around the fireplace with others, chatting and exchanging travel stories. Vijay and his wife were also at hand, telling us interesting facts and anecdotes about the place and surrounding jungles. It was soon time for dinner. Meals here include North Indian, South Indian and Continental options. We found the Continental dishes to be very good and the others reasonably good. After dinner, as other guests dispersed, we wanted to prolong the fun. We decided to light up the fireplace in the room. Soon it came to life, filling the room with a warm orange glow. Watching the fire leaping through the pile of wood, while feeling the warmth on my feet, always gives me satisfaction of a life well lived. As the fire burnt, I tucked myself under the blanket to get to a nice deep sleep. I got up at the first light, not wanting to miss the early morning shots – and the effort was rewarding. There were dense mist all around, only the peaks of the hills were jutting out from under. As the sun rose, an orange glow filled the sky, slowly turning to yellow. Sunlight passing through the mist brought the lake waters to view. There was dew-soaked grass under my feet, their tips twinkling in the sun and complete silence all around, only punctuated by occasional bird calls. I turned to see the bungalow behind me glowing in the first light majestically. 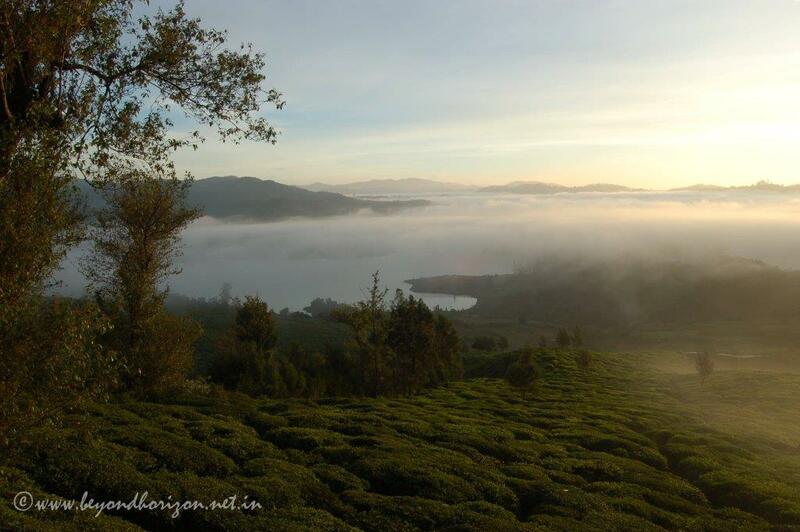 It took some more time before the tea bushes along the hill became visible, bathed in morning sun, mist wafting over them. The sky was clear, with broken clouds floating by. The lake was clear now, reflecting the blue sky in full glory. The feeling was almost surreal.